It is the duty of the City of Webster City’s Fire Department to PREVENT all possible emergencies, to PREPARE for all possible emergencies, and when needed, to PERFORM all necessary firefighter/rescue functions with speed, excellence and professionalism. The City of Webster City’s Fire Department is a combination full time/volunteer department dedicated to the community and its safety. The Fire Chief is responsible for the fire protection, rescue and fire prevention of the City of Webster City, population of over 7,877 people, as well as, the surrounding townships. The department is comprised of four (4) full-time paid members, three (3) relief/ on-call members and 24 volunteers. • Rescues including, high angle, confined space, grain bin, trench, swift water, ice rescue and any other need our citizens may have. Chuck was born in Burbank, CA. He has been in the Fire service since 1998 where he started as a Volunteer Firefighter in Merriam, KS. He then became a full time Firefighter with Hutchinson Fire Department. He then moved to Derby, KS, where he was Lieutenant and shift Supervisor. Over his career he has attained certification in Firefighter I and II, Hazmat Awareness and Operations, Driver Operator, Aerial Operator, Instructor I, Inspector I (ICC), Officer I and II, and is finishing his National Fire Academy Executive Fire Officer Program, year four. He has his Associates degree in Fire Science and his bachelor’s degree in Management and Human Relations. 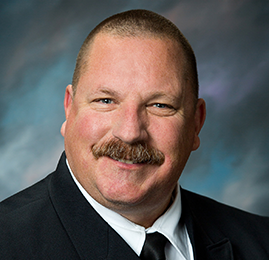 Chuck has also worked as an adjunct Instructor for Hutchinson Community College and Butler Community College and has instructed for KU Fire Training Institute. Chuck is married for 21 years to his wife, Lisa, and has three boys, 14, 12, and 10 years old. If he is not at work, he enjoys outdoors, fishing, hunting, and helping coach his boys sports teams.